In 2016, Ash Keating developed a painting for choreographer Lilian Steiner’s Admission into the Everyday Sublime, a dance performance that was part of the Next Wave festival. Those who saw the performance will recall Keating’s enormous painting exuding a monumental energy not unlike that of the mysterious monolith in Kubrick’s 2001: A Space Odyssey. This element of emotional theatricality began a new turn in Keating’s work which will be at full force in his latest exhibition, Gravity System Response, at North Melbourne’s Meat Market. Those familiar with Keating’s public murals—the VCA, NGV and RMIT are just some of his commission sites—will recognise his distinctive style of spraying and layering paint to achieve a topography of abstracted landscapes. Keating has never shied away from acts of grandeur but the works in this exhibition suggest a maturity in his oeuvre. His paintings have evolved from the spectacular to the theatrical in their move from facade to canvas, from public space to controlled environment. Theatrical lighting designer Matthew Adey has been working closely with Keating to develop a system for lighting the paintings to dramatic effect. Adey has said that his lighting design for Gravity System Response is a way of “suspending the canvas in negative space to draw you into it.” The audience is encouraged to perform a meditative procession past these still, monumental works and to stay for extended periods. Adey’s “tight focused lighting technique” will work hand in hand with the Meat Market setting, combining to produce a sort of agnostic chapel and bringing to the fore the energy of Keating’s canvasses. 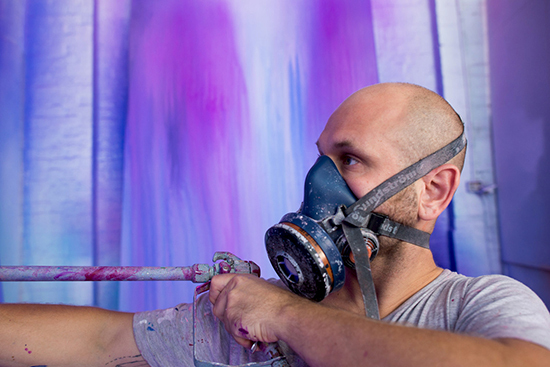 Keating’s process involves mixing rich and sometimes luminescent paints, applied with an airless sprayer to the canvas. 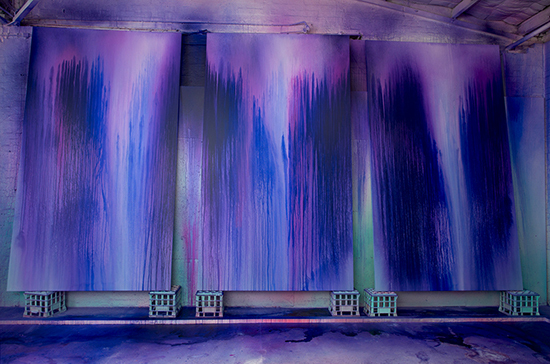 Between layers he sprays water onto the wet surface to create a translucent set of strata, allowing colours to interact. He expresses excitement, calm or purity with the combination of these techniques and his careful choice of colours. Entering the Meat Market, the audience encounters a number of small canvases. Then, moving through a set of black curtains, they come face to face with three versions of the earlier canvases, only now they are much larger. A triptych of sky blue, cobalt and magenta faces onto a second triptych of earthy ochres and oranges. The former elicits a frenetic energy while the latter effuses warmth and purity. Between these two triptychs and on the adjacent wall is a quadriptych of magentas, orange and pink that creates a balance between the two divergent triptychs. 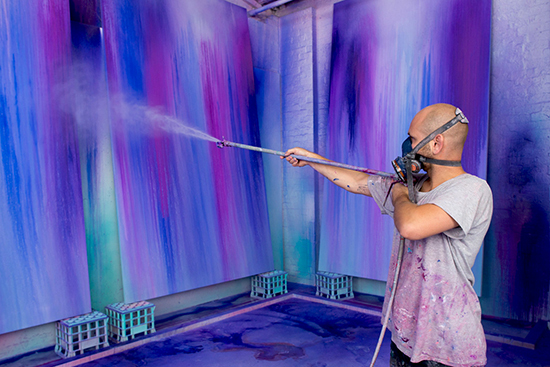 Each canvas measures a colossal 3.5 x 2 metres. But the scale does not feel threatening: rather, it encircles and invites the viewer in. Having visited him in his studio numerous times during the process, I witnessed the way in which Ash Keating’s emotions peak and trough with the layering and colouring process. Simultaneously, the works themselves exude a certain energy that affects the mood in the studio. During visits, I could quickly gauge whether the artist would be calm or agitated based on the state of his canvases. He would work on a single set of paintings for weeks if not months: the end point based purely upon intuition rather than any need to work towards a strict deadline. In many ways, the final product as theatrical exhibition mimics the audience-less performance staged in Keating’s studio in the months prior. Having moved his process away from the public eye, Keating has now employed the expertise of Matthew Adey to produce a delayed performance that expresses the emotion and drama not seen by the audience. The choice of the calm, dark environment of the Meat Market also creates a potential for catharsis that again mimics Keating’s experience during creation. In this sense, the lighting dimension of Gravity System Response helps reveal the emotional energy ingrained in the fabric of these paintings.